5/30/2015 DETROIT, Michigan (May 30, 2015) - Venezuela's E.J. Viso won his fourth Detroit Belle Isle Grand Prix SPEED Energy Stadium Super Truck Series Presented by TRAXXAS race in five attempts Saturday by making a last-lap pass on 17-year-old Scotty Steele in a driving rainstorm. The wet conditions around the 2.35-mile street circuit made driving conditions extremely slippery which strung the field of 11 trucks out and caused drivers to race cautiously and capitalize on other's mistakes. Steele led several laps of the race but the experience of Viso, a former IndyCar driver who has competed in wet conditions many times including races at Belle Isle, took advantage of a slide by Steele which opened the door for Viso. Both Viso and Steele are teammates driving identical LIVE/Think Loud Entertainment trucks. Viso won all three SPEED Energy Stadium Super Trucks Presented by TRAXXAS races at Detroit in 2014 and finished second in Friday's first weekend race. Burt Jenner of Los Angeles, Calif. came home third for the second consecutive day in his Gladiator truck. P.J. Jones in a Traxxas SST finished fourth, Keegan Kincaid in a second Traxxas truck finished fifth, Robby Gordon's SPEED Energy SST finished sixth, Detroit's Aaron Bambach in the 3Dimensional.com truck came home seventh, Arie Luyendyk Jr in the Quicken Loans truck was eighth, Charles Dorrance in the Sportsman's Finest SST was ninth, Bill Hynes in the third LIVE/Think Loud Entertainment truck was 10th and Larry Job in the Toyo Tires truck finished 11th. 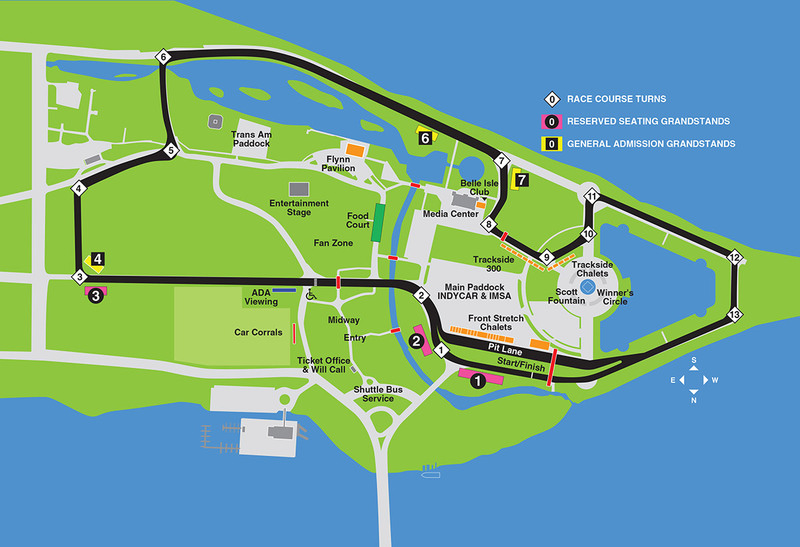 The race on the beautiful Belle Isle circuit was the eighth event of the SST season. Detroit race No. 3 is scheduled for Sunday at 2:15 p.m.
"Scotty did a great job and I think he has improved so much over the last year that I have been racing against him," Viso said. "I just waited patiently for him to make a mistake because driving on this slick circuit causes everyone to make a mistake at some point. He did a great job in the rain, but when I saw an opportunity I had to take it."